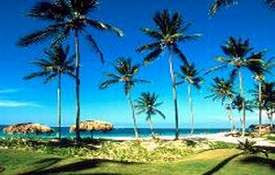 The seashore with its white sand give us an impression of ma¬king refreshment to the visitors. Watch the process of repairing wooden boat in traditional way. The underwater life of this place is quite interesting. The beautiful coral-reef, the unique of fishes and sunken ship has become the attraction for the divers. This beach is located on North Leato, about 12 km from the town center.